I don’t know about everyone else, but for me, whenever my in laws are visiting, I tend to have an above average number of kitchen mishaps. Take for example, the day a kitchen shelf “leapt” from the wall. It smashed my precious mortar and pestle received as a gift from Bjorn as well as a jar of balsamic reduction which spattered most of the kitchen with a thin layer of sticky brown goo. There were also those blueberry muffins that turned out like hockey pucks the day I invited Val for breakfast a few years back. Most recently, I attempted to make deviled eggs out of some lovely, fresh, farmer’s market eggs, and –the eggs would not peel. When the world hands you eggs that are locally grown, fresh, organic and lovely that —will not peel– make Disheveled Eggs! 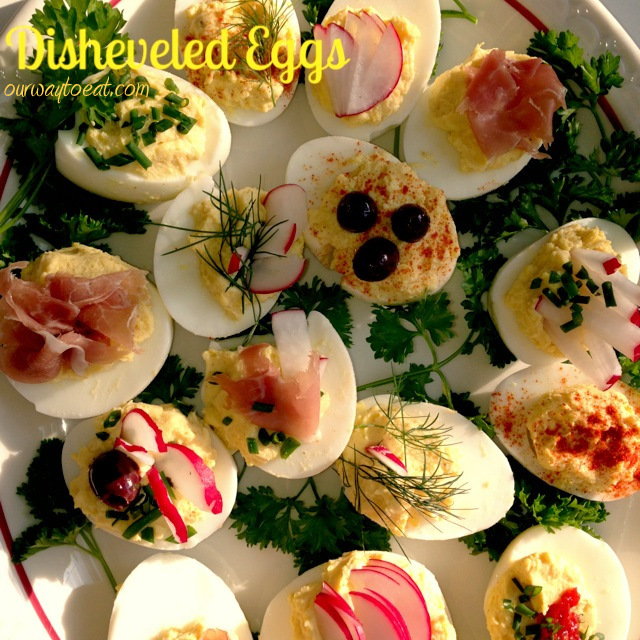 Disheveled Eggs start by following your favorite approach to making Deviled Eggs, mine being a stiff, simple egg yolk mixture with a little mayo, minced celery or shallot, salt, pepper and a bit of mustard to taste. The key to Disheveled Eggs is to pile on eye-catching, creative and tasty garnishes to disguise and distract from your less-than-perfect peeling and filling of the egg halves. Among my great garnish ideas either used or imagined are thinly sliced radishes, finely chopped chives, sprigs of dill and parsley, thinly sliced baby dill pickles, a tiny spoonful of capers, some flaky tuna or a little smoked salmon, a tiny bubble-tower of salty of caviar, a squirt of Sriracha “Rooster Sauce,” tiny olives, a heavy shake of smoked paprika, or a tiny pile of thinly sliced prosciutto. No matter how much you are sweating it in the kitchen, if you bring this platter of fancifully garnished eggs to table you will receive reactions of awe and delight–trust me. My quick-fix to classic deviled eggs was inspired by James Beard Award winning Canal House Cooks Every Day cookbook by Melissa Hamilton & Christopher Hirsheimer not only did this lovely tome inspire many of my imaginative garnishes, but they finally gave me instructions to cook eggs from soft to medium to hard with reliable results. For the ambitious who prefer to follow a recipe, here is a deviled egg recipe using homemade mayo piped into the egg halves recently posted on Amateur Gourmet. Bon Appetit! I’ve been missing my blog! We’ve been busy visiting Mexico, hosting visitors, working and waiting for the snow to melt. Here’s a tasty and easy appetizer I made this morning that was inspired by Elsa’s Ham and Asparagus Toasts by Rachael Ray with a few tweaks– I used deli slices of prosciutto and Swiss cheese instead of ground ham and fontina, less butter and smaller slices of bread. These tweaks made the assembly easier, less expensive and more appealing, I think. It is easy to leave the prosciutto off of as many slices as desired to make this appetizer friendly to vegetarians. 1. Snap the woody ends off of skinny spring asparagus and steam for 2.5 minutes in salted, boiling water, then run the asparagus under cold water to stop the cooking. 2. Slice a baguette into 3/4 inch slices. Arrange the slices on a sheet pan, and toast the slices 6 inches below the broiler in the oven a minute or two. 3. Mix 2 tablespoons melted butter with 2.5 tablespoons of grainy Dijon mustard and brush over the toasted bread. 4. 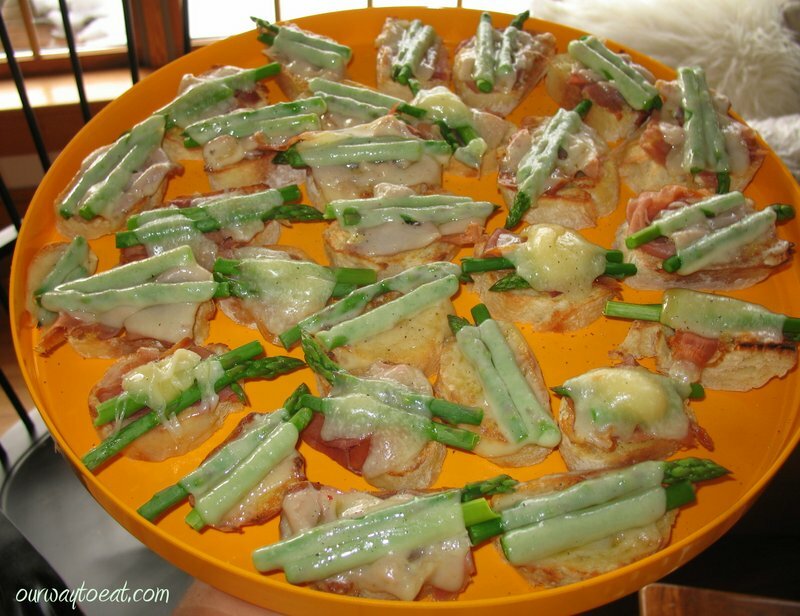 Top each slice with a pile of prosciutto, a halved sprig of asparagus and a half slice of Swiss cheese. 5. Return the sheet pan to the broiler and watch carefully. Remove when cheese is melted. Season with ground black pepper and serve on a platter. I brought the platter to my family’s weekly Saturday morning coffee gathering, and came home with an empty platter. Success!